First thing’s first: Sorry for being such a frog on a log last week. I don’t know what came over me, but I had a really bad case of negative vibes and had been depressed the whole week. I normally try to remain a very positive person, but we all have bad days and for me, it’s just unfortunate that it became a bad week. Aside from all that, today is an exciting day for me because I just got some of my new art supplies in! Hello oils! The color tubes were the first thing for me to get in the mail and I am still awaiting a shipment from Trekell. If you’re an artist and you don’t know who they are, I highly recommend you check out their website! I was amazed when I saw the prices of their supplies (some were up to 40% off)! 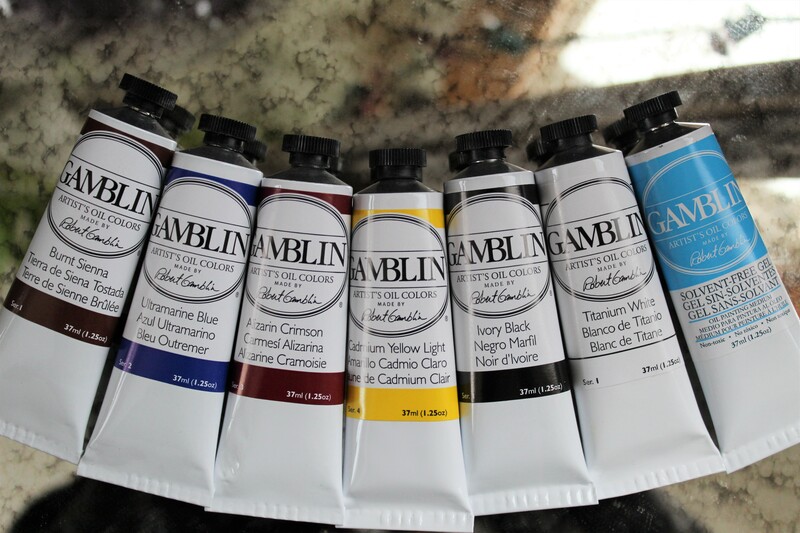 Since I’m just starting out in oils, I’ve went on with the Gamblin brand recommendation from other artist friends. For acrylic paints, I have been such a huge fan of Grumbacher products hands down, but Gamblin seems to be the ring leader when it comes to oil painting! Last week, aside from being in a negative funk, I also had an issue with the painting I was working on and was never able to upload a YouTube video as a result. I hate when I’m not able to keep up with my uploading schedule even though most people understand. It was another canvas piece and I am sad to say that the canvas just couldn’t hold the amount of layers I was putting on. In the end, things got so messy and “cakey” that I wasn’t able to achieve a smooth look and the paint was beginning to smudge and wasn’t adhering correctly. I was so frustrated by this problem that I hadn’t even finished and had to deem it a lost cause. I am all for never giving up on your art, but in this case, there really wasn’t much I could have done. I set it aside as a learning process. Will I still be using canvas, you may ask? While I am currently receiving a few canvases in the mail as well, I am mainly going to be saving them for commissions. I currently have a few commissions I need to start that the clients wish to be done on canvas, so I will probably only create content on the wood panels moving forward. I’ve also been doing a little tweaking on my website to make things a little easier to navigate! You will find my newly updated commission terms and conditions as well as my artist statement! I finally felt confident to write these up, and I think it really helps me step into a more professional role as an artist. Check those out if you’ve ever been interested in a commission or wish to hear more of what my art and style is all about! I feel like this has been a very boring post. Sorry about that! I am so flattered if you stuck around to read the whole thing! I just wanted to give you an update so you won’t be completely caught off guard with the new look of my art that is soon to come! This week’s piece will definitely be on one of my new wooden panels, but I’m not sure if I will be using oils just yet. That depends on if I get the rest of the supplies in time. Have a blessed week and a fabulous Monday!